Welcome ,This Site provides information on the mythological origins of all universal religions. Religious scriptures (including the Quran, Torah and Bible) are a Registry of Astronomical phenomena written in a Mythological format. The evolution of our modern Religious Concepts began with Astronomy, and evolved through Mythology and Astrology into modern religion. Many of the Hebrew Myth Concepts are traceable to Ancient Egypt and Mesopotamia. Jesus Christ, the Sun God, is a Cosmic Myth - on a par with Osirus, Horus, Samson, Adonis, Moses, Abraham, Solomon, Noah, Krishna, Mithra, Quetzalcoatl and many other solar Demigods. Evidence clearly shows that the 12 Apostles were symbols of Zodiac Signs, and that Jesus Christ symbolized a Sun God and in some aspects a Moon God. It is clear that the Tales within the bible are Allegorical depictions of the interactions between elements of the Cosmos. The Esoteric Level of religion is a Science that is mathematical, coherent, logical and provable. But this science of Truth is veiled by the masque of mythology. Some are repulsed by this masque and unfortunately turn away and denounce all concepts that support the possible existence of a Creator God Force. The great majority accepts the myth at face value – believe it or not. But fortunately, there are some that choose the path of Investigation, of which you and I are a part. Within this vast incomprehensible universe, this planet indeed this solar system is no more than one grain of sand on one beach amongst trillions of other grains amongst trillions of other beaches. This is astronomical fact, not hyperbole – ask any astronomer whether the forgoing statement is true or not and they might say that I have overstated our significance within the universe. Nevertheless, we have the gall to take our Tribal gods that over time have been elevated to National gods and Regional gods (because of the political, financial, and military advances of their adherents) and appoint these fabled deities as the creators and sustainers of all that exist. How ridiculous this is! Within the bible the biblical Editors give the name of god as “I Am”, which is the short form. The fuller expression was “I Am Becoming” (Evolving). I suggest that this is the best of names that any deity or person could possess. I have written five books on the subject of religious myth and symbolism. The first was "The Biggest Lie Ever Told" followed over the years by the series of books titled "The Astrological Foundation Of The Christ Myth" - Books One , Two and Three and Four. The purpose of these books is to explain the seminal relationship between Astronomy, Myth and Modern Religion. The books prove that ancient Myth/Religion was, in fact, a written pictorial (symbolic) record of the celestial movements within the Cosmos, under the Type of Mythical Deities. 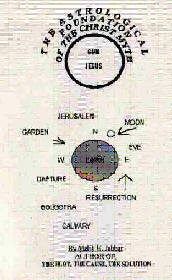 The History of the biblical Jesus Christ is drawn from the symbolical history of prior Sun Deities. His birth through to his death , as represented in the bible, is a symbolical representation of the annual Sun Cycle and other cycles at different levels of interpretation. The Symbolisms are Thoroughly explained in my Books. I have chosen the History of Jesus Christ, within the Gospels, as a means of showing the Astronomical correlations between the life of Christ and other Solar Deities. Most of the biblical sagas of the Old Testament and the corresponding tales within the Islamic Quran contain the same mythical symbolisms as the biblical Jesus. The history of the Children of Israel, in the bible, is pure Symbolism. Likewise for the history of Abraham, Noah, Solomon and Most of the other biblical notables. Their births, Lives and Deaths, are allegorical representations of Solar/Lunar/Cosmic and Agricultural cycles. My books interpret and explain this Ancient Symbolism. The bible is replete with stories of miraculous events. This holds true for events described in the Old Testament , as well as the Gospels and Quran. Should these fables be taken literally? Or, Is there a Rational , Provable interpretation of the various incredible events described in the bible and other mythical scriptures and tales. Is there an heretofore hidden code or codes that when understood can bring to Light , the True meaning of the Biblical Scriptures? The answer is Yes! Think of It! Did Jonah actually live within the belly of a Fish (Whale) for three days, and then emerge as a living being? Think of what we are saying, when we take such a story as the literal Truth. Did the Israelites actually cross the floor of the Red Sea after the waters pulled back and made a path for their transit? Does belief in God require the literal belief in any tale, even when it defies All common sense and logic, and sanity? And the many Miracles ascribed to Jesus in the Bible , from walking on water, to forty days being tempted by the Devil, raising a dead man to life , after three days of decomposition (A Gory Thought), His being crucified between two thieves at Golgotha, Is all this the Literal Truth, or is there an underlying meaning that begs our investigation. Again, the answer is Yes! There are esoteric interpretations to All of the Fables in the Bible and other mythical scriptures - interpretations that are mathematically provable and scientific. If you are one of those In Search Of True Light, then my books may prove worthy of your inspection.